If you publish on Amazon, the Amazon Best Sellers Rank, or just "sales rank", is something you will start to pay a whole lot of attention to. It is updated approximately hourly and in general is an indicator of how well your book is currently selling in relation to other books. The book ranked #1 has sold more copies than any other book on Amazon. Some people live or die by their sales rank, however, I think total book sales are a much more valuable tool when determining if a book of yours is successful. Many people say that another way to think of the sales rank is the amount of time that has passed since the book has sold, in relation to other books. For example, when you sell a copy your sales rank improves. Then as other people sell copies of their books, your sales rank starts dropping until you sell another copy. It's important to remember that this is a snapshot of where your sales currently are, not an aggregate, so the sales rank can fluctuate greatly during the week, or even during a single day. Here is a screen shot of the sales rank for one of my books over a 2 week period. It ranged from 36,000 to 415,000, a large variation. There are many factors that affect the sales rank. The largest and most obvious is the amount of books you sell. More books sold equals a better sales rank. Though technically, it is more books sold in relation to other books. If you sell 10 copies more than normal but other books sell 11 extra copies, your sales rank will get worse, despite the fact that your sales have increased. This is one more reason I focus on sales instead of the Amazon Sales Rank, I don't care if my rank gets worse as long as I'm selling more books. Another factor that complicates the sales rank is the historical stability of your book sales. If your book usually sells several copies a day, its sales rank won't be hurt as much by going a day or two without sales as a book that doesn't sell well. Amazon gives better selling books the "benefit of the doubt" for a longer period of time than it does to worse selling books. I think many people get hung up on their sales rank by trying to monitor it closely, track it to sales, and try to manipulate the number. This can be so frustrating because of the huge fluctuations in sales rank. I personally find it better to focus on book sales and just have a general idea of what your rank is. I've been caught up tracking the sales rank, especially during launches or when it's getting high (as you can see from my tweet below), but maintaining a focus on sales will save you time and pay off in the long run. There's nothing wrong with occasionally celebrating your sales rank, especially during launches, but a focus on book sales instead of sales rank will pay off in the long run. The amount of sales associated with a specific Amazon Best Sellers Rank varies throughout the year. In summer you usually need to sell less books to get a higher rank than you do during the holidays. As a general guideline, I tend to break the sales rank down into broad categories. 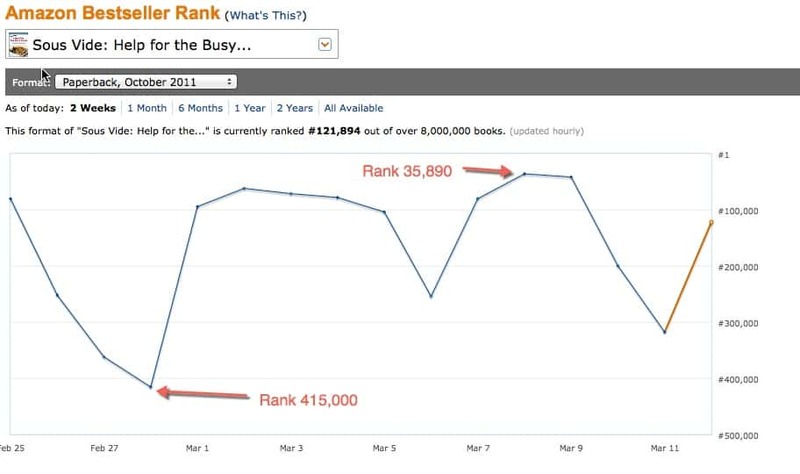 A sales rank in the top 5,000 is very high and can be hard to beat, especially once your book sales plateau. The number of books sold to get into this range varies greatly, but a top 1,000 book may be selling 50 to 100 copies a day while a top 5,000 book might be selling 20 books a day. A sales rank of 5,000 to 30,000 is what I would consider a very successful book. They are usually selling anywhere from 10 to 2 books a day. Books in this range are successful without being too popular. They are normally selling about a book or two a day. While this range is huge, the difference between the 30,001 book and the 99,999 book might be an extra 5 to 10 copies sold during a whole month. Anything out of the top 100,000 I don't consider a successful book. They still may be selling several copies a week but if you are aiming for a Viral or Monetizing book, they aren't resonating with your audience or need to be marketed differently. Here is the general breakdown of my 8 books over the last year. I have had one consistent top 5,000 book, plus most books during their launch week hit that mark. At any given time, 2 to 3 books are in the 5,000 to 30,000 range and 2 to 3 books are in the 30,000 to 100,000 range. Another 2 to 3 regularly drop out of the top 100,000. Those books that don't sell well still contribute a few hundred dollars a month, but it's a lot more fun to have a top selling book! In addition to the overall sales rank described above Amazon also tracks the sales rank for each of its individual categories. You can see two of these listed under the overall sales rank in the image at the top of this article. These are only displayed if the book is in the top 100 books in a category.